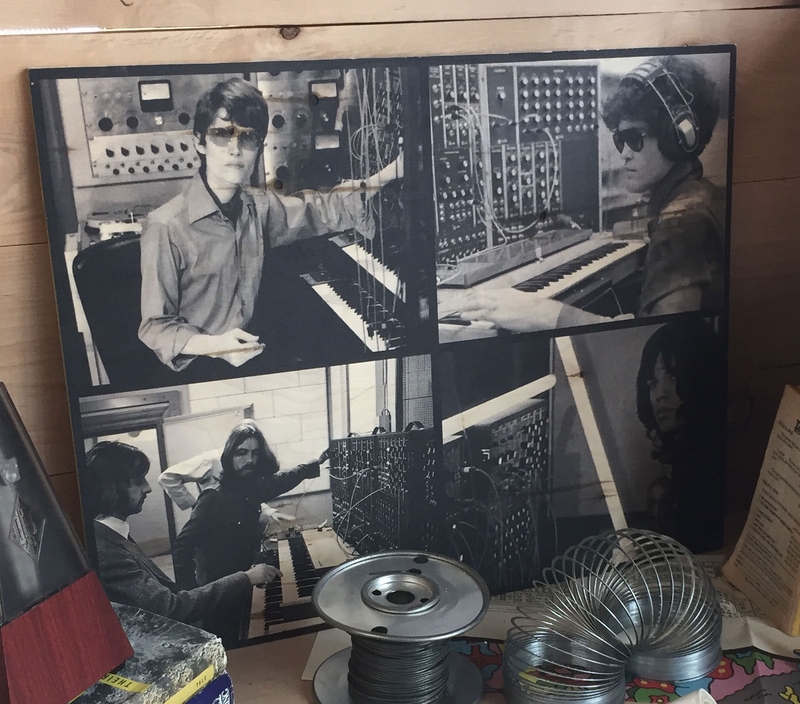 Went to Asheville, North Carolina in May for some mountains & trees but did not know that Bob Moog had setup shop in Asheville. I have owned my Minimoog Voyager synthesizer for a year or so. The tour was the the highlight of the trip. The tour is free and lasts about an hour. 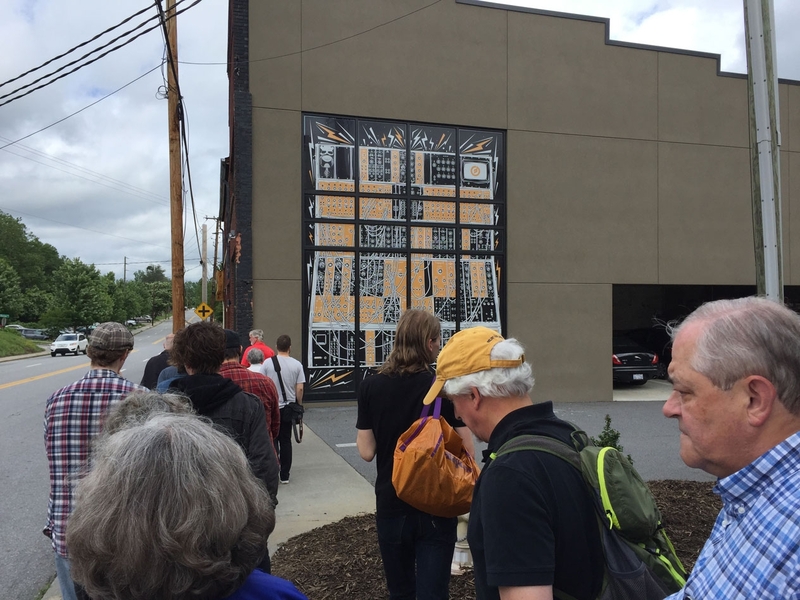 The Moog factory is right in downtown Asheville which struck my as similar to Greenwich Village, NYC in appearance and vibe. The Moog Mother 32 (Eurorack) Synthesizer assembly line.....The "Mother" boards arrive already soldered so completing a Mother takes about an hour and a half. The gentleman in blue is the tour guide who was full of interesting stories such as how the original Minimoog Model D was so powerful and deep that it was capable of inducing labor which is what happened when Geddy Lee's wife was very pregnant and happened to be at a Rush concert sound check when Mr Lee fired off his minimoog. Ambulance was called and their first child was born shortly after......Great story! 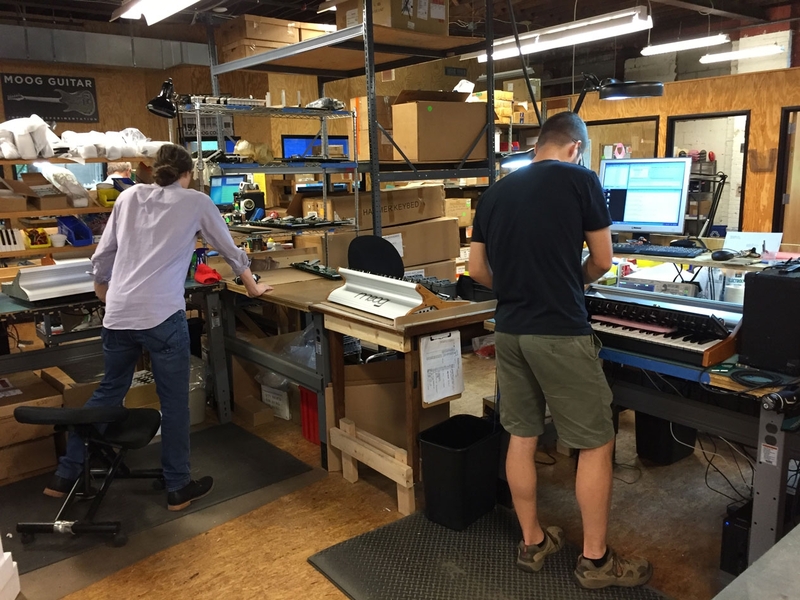 The Moog Sub 37 assembly line.....apparently their best sell synth. 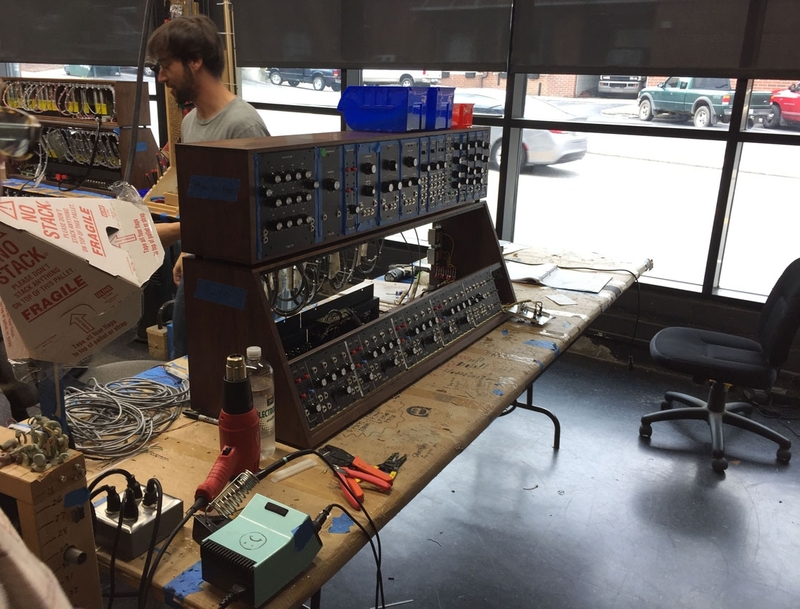 The Minimoog Model D assembly line.....The lady at the back installs all the electronics, the man sitting works on just the mod wheel and pitch bend, apparently it is quiet involved to get right and the standing fellow finishes the synth. 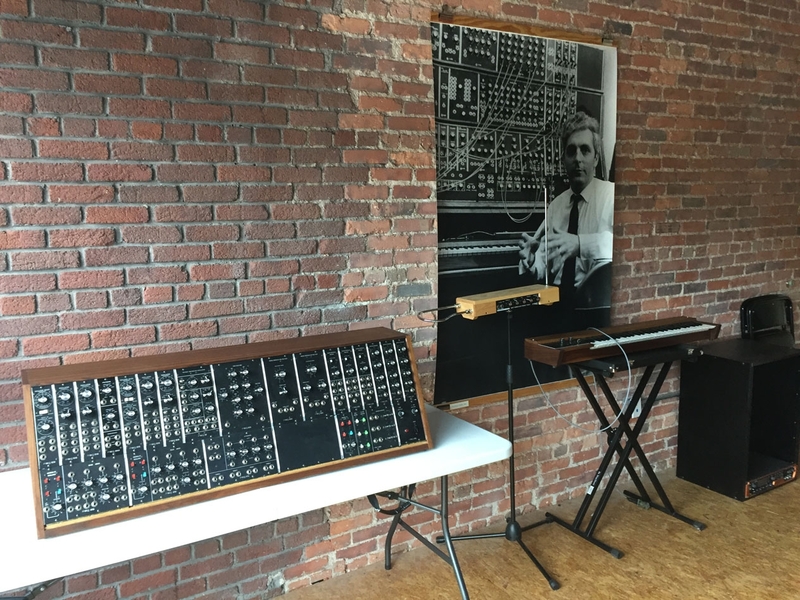 This is obviously the recreation of the original Model D and is the only minimoog in production as the Moog Voyage is not made anymore. The Model D is made with about 95% sourced US materials....the birch wood comes from Tennessee, a good deal of the electronics are made locally in Asheville. 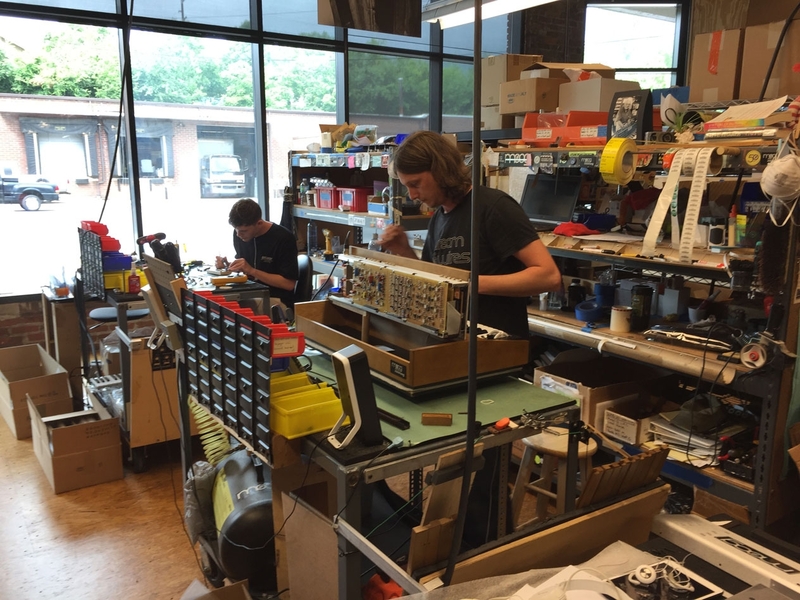 Bob Moog established an electronics engineering course at a local Asheville college that a large amount of Moog employees have come through. Minimoog burn in bench......All Minis are turned on for 24 hours and tested to be properly functioning. The Moog Modular Synthesizer production line.....creation of these are slow. 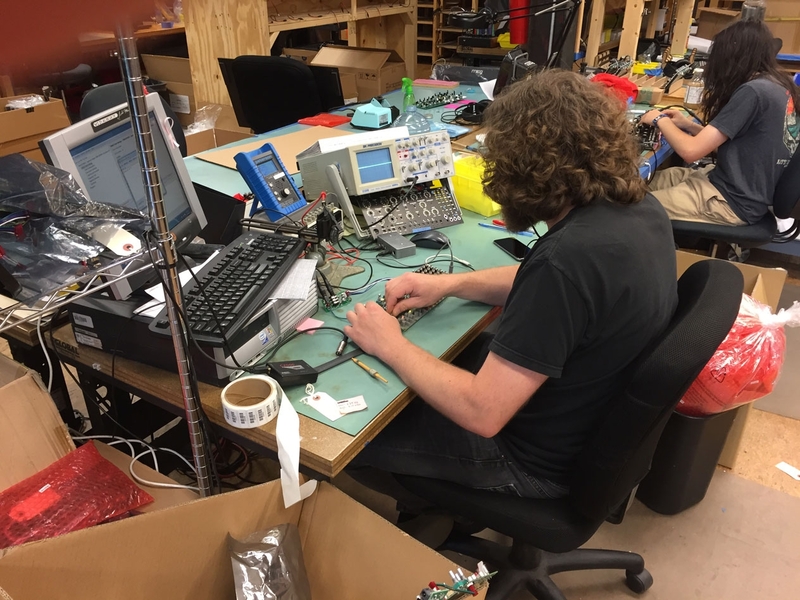 These two guys install and connect all the modules into their cases. The modules are built in another building. One modular was having a spring reverb installed as we came through and what appeared to be an small ordinary guitar amp was turned up......have to say I have never heard anything like it. 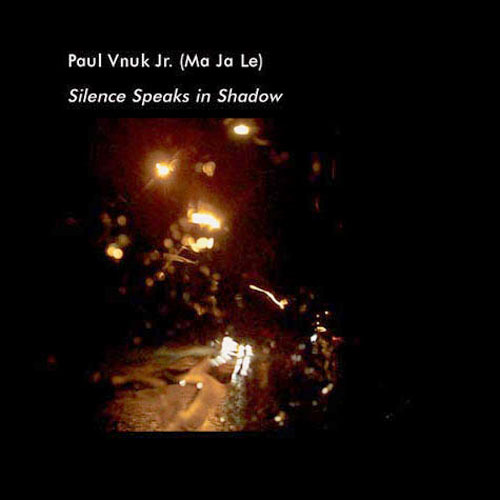 It was not that the sound was loud it was that the sound penetrated everything and filled the factory with a sonic presence beyond description. 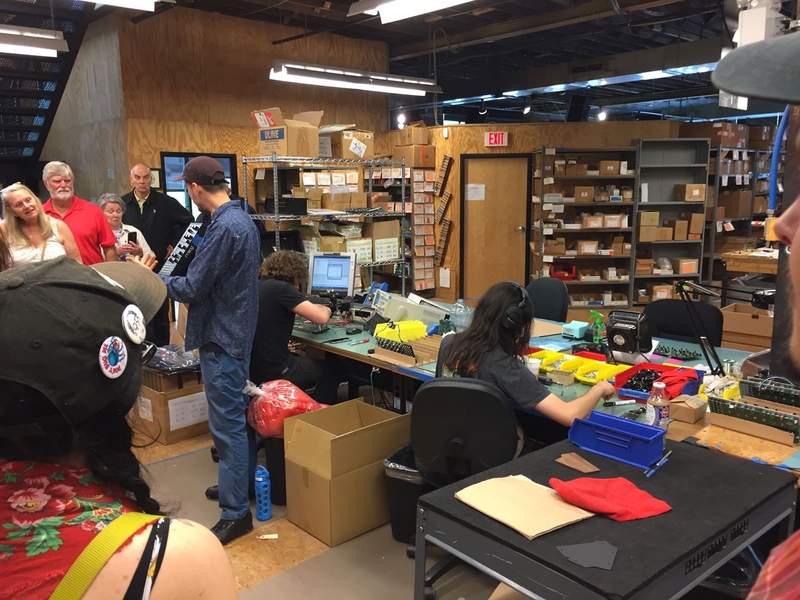 This building is where the Moog Modular Modules are made and custom work. 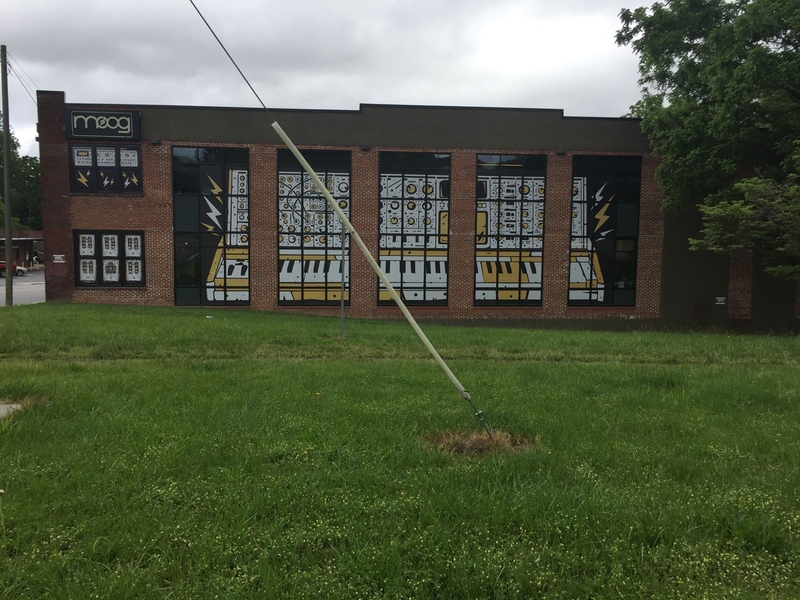 It also houses the Moog Sound Lab Studios......graphic on the window is Keith Emerson's Modular. Just outside the Sound Lab and the Lab itself. This was the end of the tour and where we could ask questions......I had many like was Moog going to make Eurorack versions of their big Modular but only asked one. 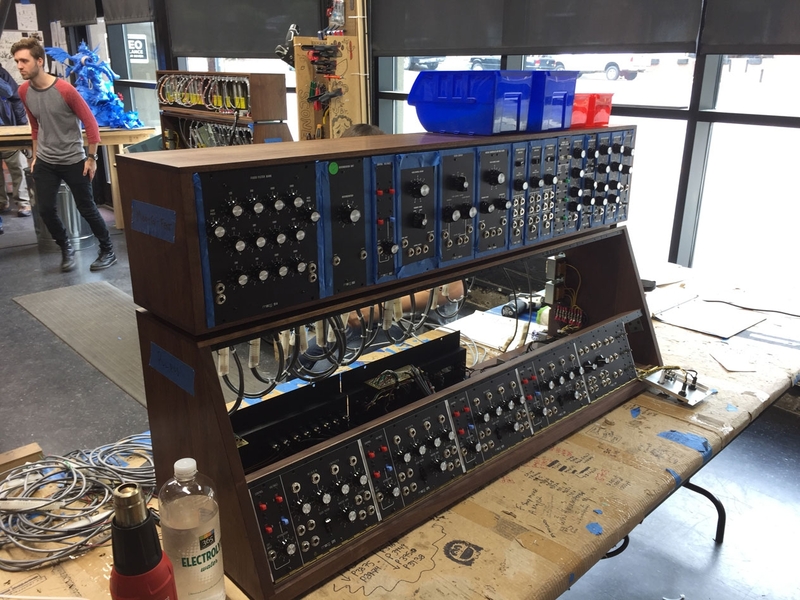 "What was the chance of Moog making a polyphonic instrument like the Memorymoog?" the answer....."There is always a chance." 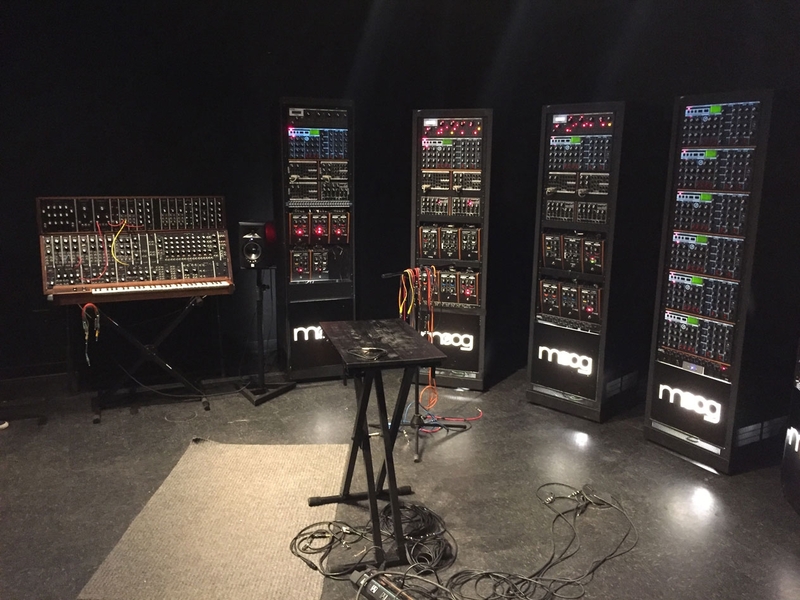 We did not get to see the R&D departments where sixteen engineers work on the future of Moog instruments.......top secret. On my way out I saw this little...shrine I guess.......can you recognized the people in the photographs? Hey! 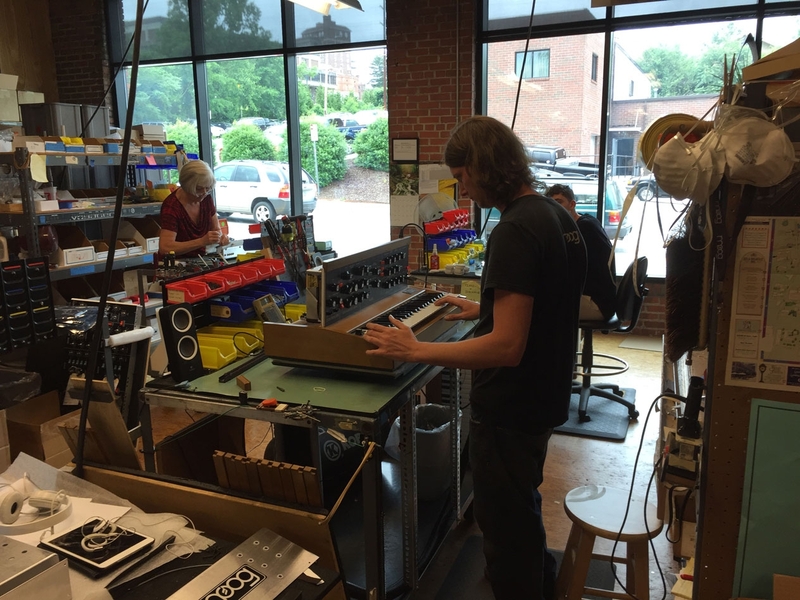 I was in Asheville and the Moog Factory in May too! I was there playing the Asheville Electro-Music Festival in Black Mountain, and stopped in to have my Voyager tuned up. Hi Paul....I was in Asheville the last week of May. 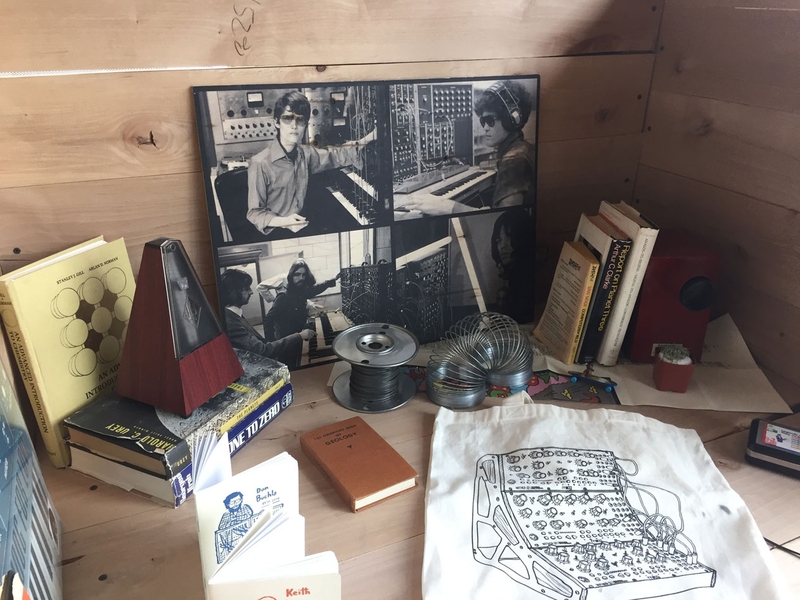 Is Black Mountain the famous Collage? I did not know they had a Electronic music festival but it makes sense. 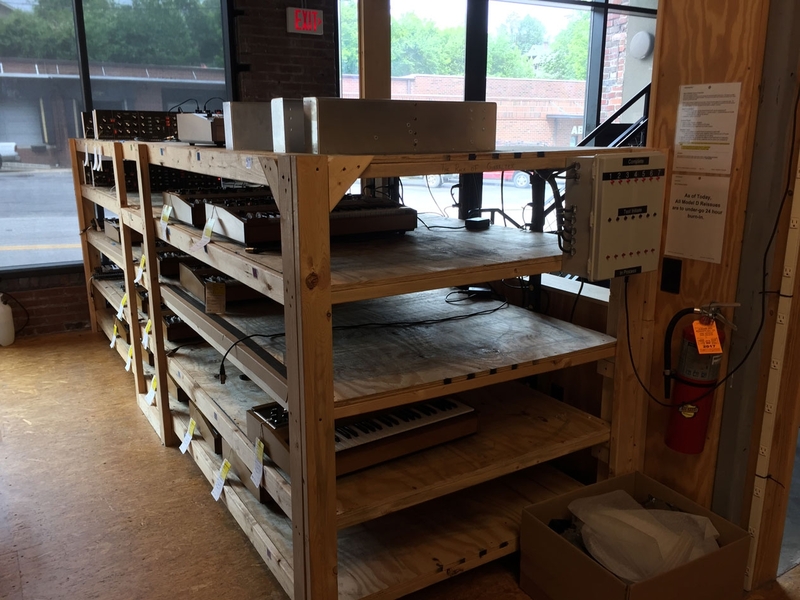 Make Noise Eurorack Modular is also in Asheville but did not get to visit them.....Tony Rolando, the man behind Make Noise worked at Moog for I while I believe.